Posted January 14th, 2015 by Brian S. Mazar, MBA, CBI & filed under American Fortune. Many business owners pour their proverbial “blood, sweat and tears” into their businesses. To them, the business represents far more than a paycheck…it’s an extension of themselves, a representation of their values and work ethic. It’s their second home or their second family, their retirement, their legacy and sometimes their family name. So when it comes time to sell a business, it’s only natural for owners to struggle with the idea of selling their business. It’s as much an emotional decision as it is a personal or financial one. How to Sell a Business Advocate program was developed to help business owners successfully sell a business and provide support and assistance for these business owners. Whether an owner is just beginning to play around with the idea of selling a business or they were “ready yesterday” to sell their business, Sell a Business Advocate can step-in and help… help being the essential word. For a growing number of business owners, it’s become important to actively participate in selling their business. 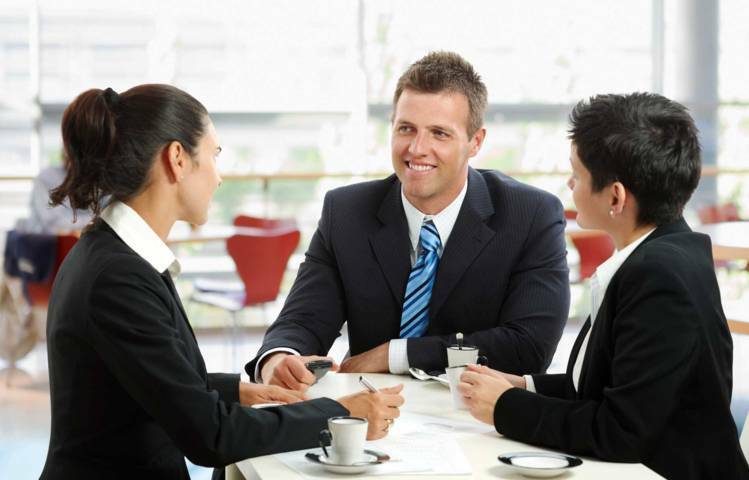 Today small business owners are less likely to hand over 100% of the work of the selling process to a business broker. Today’s business owners are more likely to be more involved in selling a business without giving up full control to a business broker. Many business owners want to participate in the sale of their businesses and save money on business broker commissions. However, most business owners are very open to obtaining as needed business brokerage assistance to help them successfully sell a business and save money on business broker commissions. To the dismay of many business sellers, however, there haven’t been any supportive, business broker companies offering cooperative business brokerage services that some progressive sellers want. Their choices have been to either piece an advisory team together and sell a business by sale owner or agree to the comprehensive (and costly) business brokerage services. Business Sale Advocate changes all of this. Now there IS an option for business owners who want to be more involved when they decide to sell a business. American Fortune Mergers & Acquisitions Founder, Brian Mazar, has launched an options line of services designed to assist small business owners in the task of helping them sell a business using the “business sale advocate” program. These services (exit planning, pre-sale preparation, valuation and sales price, marketing and advertising, screening buyers, due diligence, negotiations, closing the deal and ongoing assistance) can be chosen separately or in packages to complete the advisory assistance with the “sell a business advocate” program. And each service is priced at a discount to maximize the savings passed on to owners. Are You Ready to Sell a Business? • Selling your business doesn’t have to be an exasperating, time consuming and expensive endeavor. Make things easier on yourself by using Business Sale Advocate today! 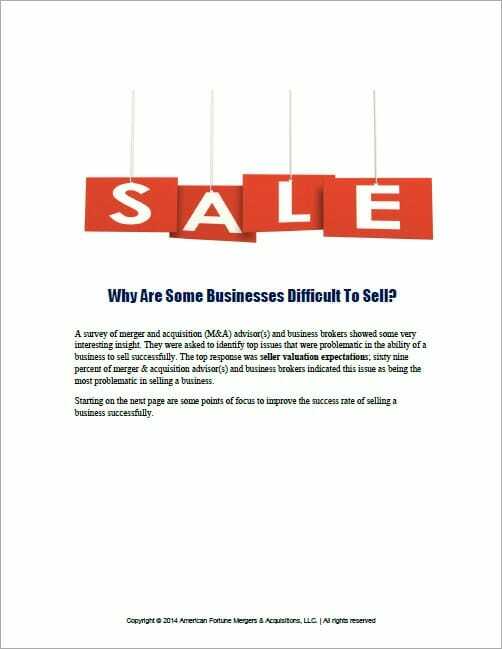 • Take advantage of our affordable business assistance in selling your business. • One of our experienced Business Sale Advocates will work with you one on one to assist you in preparing and selling your business. • You control the amount of assistance by choosing tools and support that suits your individual needs. • You will have the ability to tap into our wealth of experience, knowledge and expertise. Our support and guidance will help you tackle problems and be more creative in deal structuring. Keep Emotions Out Of The Sale: Many business for sale by owner attempts fail because the seller is still too emotionally invested in their business to be objective about it. Value Your Business: You need to know just how much your business is worth on the open market. You need to have a professionally prepared business valuation that is very defensible against the challenges by buyers. Remember, your business is worth exactly what someone is willing to pay for it. You want to find the person that is willing to pay what your business is really worth. Timing: Business Success is not the only key to a successful business sale. Obviously, some business sales are forced forward due to circumstances that need immediate action, for example, a health issue, retirement or a divorce. But if you can choose when you go on the market then you are going to want to start the selling process when the demand for business acquisitions is higher. That will assure you a better price of your business. Preparing Your Business: Physical presentation of your business is helpful but nothing compares to a solid EBIDTA and clean financials. Business buyers are attracted to businesses in healthy industries and with lots of potential for growth. You’ll also need to be sure you have the appropriate disclosure on all areas of your business. Remember, selling a business on your own does not mean you are not subject to all disclosure laws and you may be subject to legal action if you have not disclosed information properly. Marketing A Business For Sale: You can list your business for sale on various websites to provide you with Internet exposure. You also need to create a target list of potential buyers that might have an interest in acquiring your business. Let’s face it; selling your business would be almost impossible if no one knew that it was on the market. But not so fast, if the wrong people especially employees or competitors find out that you are selling your business it could have severe effects on your business. Be very careful how you advertise and market your business for sale. Provide just enough information to grab the interest of buyers. Provide information in a manner that would not allow buyers or even worse you employees, competitors, bank, suppliers, and others to identify you and your business. Roadmap To Successfully Sell A Business: It is very critical that you have a good process to sell a business. The more you know about the problems and issues that arise in the sale of a business the more likely you will be able to have an upper hand in negotiations and deal structure. Being prepared will help you in not being taken advantage of by buyers. Many buyers know how to play the game, their tactics will exasperate you and waste a lot of your time. Who Is Your Buyer: Know who you are marketing to, take an honest assessment of your business and determine who is most likely to be your buyer. Is it an investor, first-time business owner, the financial or strategic buyer? Once you have pinned down the buyer, market to that group of buyers heavily. Most buyers don’t start out “looking to buy”. Many buyers are simply “curies” or “just looking” but an excellent opportunity, price, or timing could make your business too attractive to pass up. Selling your business is also a numbers game, so the more people see your ads the better chance that you will receive inquiries from potential buyers. Financing: Most buyers to not have a good grasp on obtaining a loan to acquire a business. They assume that business loans are easy to obtain. They may already have told by an acquaintance that works in a local bank that they could easily obtain a bank loan. The reality is that bank loans for an acquisition are very difficult to obtain. In today’s economy and banking realities, bankers require that the buyer put down a substantial down payment and that the seller offer some seller financing. Due Diligence: Most sellers assume that the buyer has been through the process and knows the stages of buying a business. The buyer that has never purchased and or operated a business can be difficult to deal with because they have very little or no knowledge about the process of buying a business let alone operating the business. The experienced buyers are usually easier to deal with since they have purchased businesses and operated businesses in the past. However, you have to be very careful with these experienced buyers, they will tell you what you want to hear and after 6-8 months of due diligence will tell you that your business is only worth 50% of your asking price. Having a very good grip on all of the possible issues that arise during the buyers due diligence is very critical. Closing: When it is time to close on the sale many events need to be carefully coordinated. Many deals fall apart at this stage since the deal terms such as taxation, purchase price allocation, bank financing, contract language, last minute negotiation attempts by buyers, nervous buyers and other issues may kill the deal. It’s at this time that experience in Business Sales & Acquisitions can be extremely helpful. Is My Business Ready For The Market? To see the Business Sale Advocate concept in action, click here. Or, to speak with a Business Sale Advocate about help for your particular business sale situation, call us anytime at (502) 244-0480. The Business Sale Advocate Program was designed for business owners that want to sell a business without the overbearing and costly programs of business brokerage services. Business owners utilized our program “Business Sale Advocate” in how to sell a business by owner in the following areas of the USA: Columbus Ohio, Atlanta Georgia, Lexington Kentucky, Bowling Green Kentucky, Nashville Tennessee, Memphis Tennessee, Cincinnati Ohio, Dayton Ohio,Toledo Ohio, Los Angeles, Cleveland Ohio, Pittsburgh Pennsylvania, Baltimore, Maryland, Indianapolis Indiana, Chicago Illinois, Detroit Michigan, Flint Michigan, Tampa Florida, St. Louis Missouri, Kansas City Kansas, Des Moines Iowa, Minneapolis Minnesota, Louisville Kentucky, Oklahoma City, Oklahoma, Dallas Texas, Fort Worth Texas, Denver Colorado, San Francisco California, Salt Lake City Utah, Phoenix Arizona, Lexington Kentucky, Los Angeles California, San Diego California. Our corporate offices are located in Los Angeles, California, Louisville, and Kentucky. Access informative reports on Business Sale & Acquisition, Exit Planning, Business Valuation. View a list of American Fortune’s preferred partners in Accounting, Banking, Law, Business Consulting. 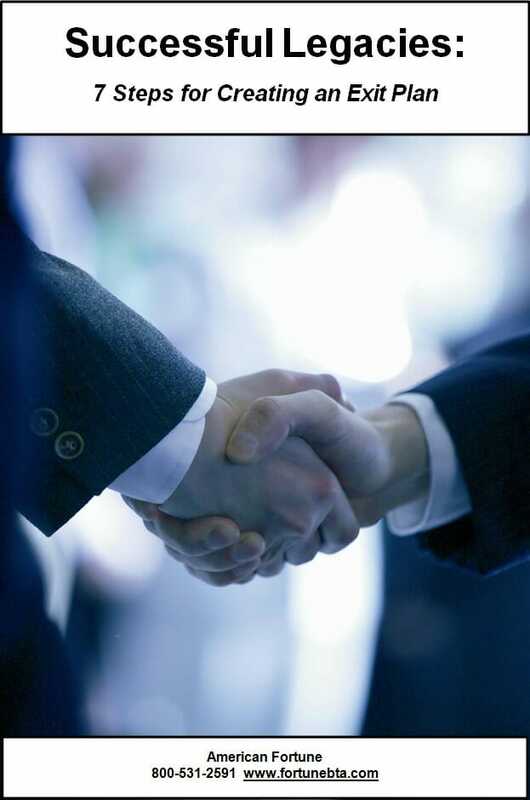 View American Fortune Mergers & Acquisitions client testimonials. Please fill out the form below for free instant access. Law, Financial Advisory and Others.